In the early days of my work in helping schools integrate technology, I remember how frustrated I was when I'd walk into a school and witness how devices were used. In so many classrooms, students would take what was written on loose leaf paper and type their work into a computer. Next, they'd print it out. The teacher would mark it up, and they'd type in the new version. Not only were they only use technology as a substitution for paper, but the way they were doing this work was actually less efficient than just using paper. I'd work at the very basic level to explain that this transition back and forth between paper didn't need to happen. Students could type right onto a computer and teachers could comment right into student drafts. Even in the relatively early days of MS Word comments (even voice comments) were a little known, but effective tool available.Next, I'd encourage teachers to augment what students did a bit by using some of the more robust word processing features. For example, students could use MS Word to help them proofread their work. They could use tables and/or table of contents to organize ideas. You can see samples of the types of workshops teachers could take to learn this here http://21cpd.wikispaces.com/Literacy. As a literacy coach, one of my favorite ways to work with teachers to help students use technology to help students produce beautiful pieces of professional-looking work with a real audience. Perhaps they were contributing to the new class newsletter that went to all the parents. Maybe they were making a brochure about the neighborhood that they passed out in the community. They might use technology to publish a few copies of a book that was shared in the school library. In this case, technology actually modified what happened to the work they did. Because it could be created with such a professional look, it was now shared and enjoyed with a wider audience. As we moved deeper into the 21st century, everything changed with Web 2.0. We were working on projects that actually redefined learning. While it was fantastic to be able to move work to the computer in ways that enabled students to share with the class, school, and community, things were changing. Work was no longer handed in for an audience of one (the teacher) or some (the school and/or community), it was published for the world to see and there were ways to let them know it was there. Student's work could now reach those beyond their own circle, it could reach the world. A great example of this comes from Courtney Woods. Let's take a look. Courtney Wood's second graders wanted the world to know how great their city was in an effort to increase tourism. In the past, these students may have created brochures about their city. They may have even been able to place them in their local tourism bureau. For this second grade class however, technology redefined what they did. They created a photosynth (a panoramic photo with descriptions) of their town. But how would the world know? Twitter! They Tweeted the tourism bureau, the hosts of their favorite talk show, the head of education, even Bill Gates as Photosynth is a Microsoft product. The result? The tourism bureau featured their work on their Facebook page, the talk show hosts came to visit their class, the prime minister of education congratulated them for a job well done, and Bill Gates invited their teacher to the Partners in Learning Global Forum in Prague. You can read more here. 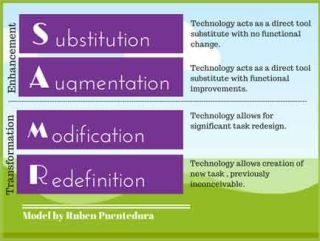 If you're an innovative educator, you might realize I just described what is known as the SAMR model. It provides a sensible way to look at technology integration. Take a look at the chart below and think about the lessons implemented by you and the teachers with whom you work? You can label lessons to indicate what level of tech integration they stand at then work with others to think about how to move them to redefinition if they are not already there. Where does the work done in your school tend to fall? If it's in the transformation range, how did you get there? If it's not what my you try to move there?